JUSTICE LEAGUE VS. 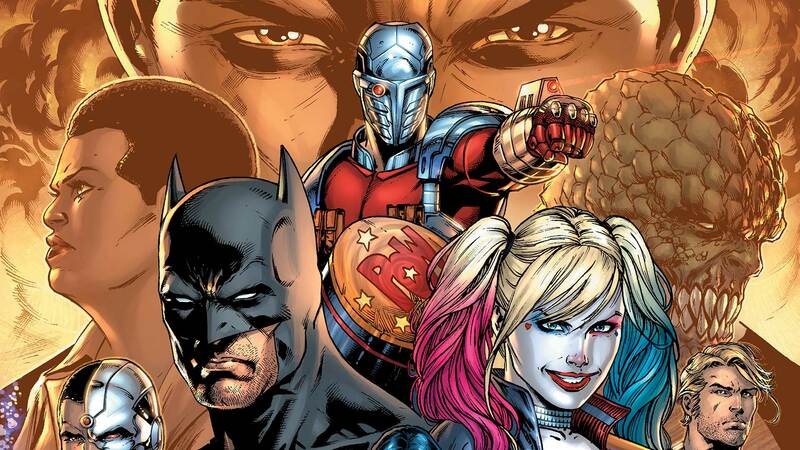 SUICIDE SQUAD is nearly upon us, so it’s time to take a closer look at the bad guys. No, not those bad guys—the other bad guys. After all, the Justice League and the Suicide Squad may have their differences, but it would take more than just a little disagreement to really set them off against each other. In fact, by the looks of it, it might take a lot more—six terrifyingly dangerous super-villains worth of “more.” These villains haven’t been seen in the DC Universe in quite some time. In fact, they’ve been hidden away so long that you might not know who they are. So with that in mind, we thought we’d put together a little primer for you. Let’s get to know our enemies. It might be pretty easy to take one look at this line up and write Maxwell Lord off as the weak link—after all, how dangerous could a normal-looking human in a suit be next to the likes of someone like Lobo or Emerald Empress? But don’t let that fool you. Lord is a master manipulator and con artist. Equipped with a handful of metahuman abilities that only serve to enhance his born-and-bred savvy, he’s acted as a thorn in the side of the Justice League International for years. He even had a direct (albeit behind-the-scenes) hand in their formation immediately after CRISIS ON INFINITE EARTHS where he attempted to seize control over the operations by engineering all sorts of disastrous publicity. Over the course of his tumultuous history, Lord’s self-righteous lack of faith in the super heroic community to think and act for themselves turned murderous, leading him to overtake Batman’s Brother Eye satellite, engineer an army of superhuman-slaying OMACs, and finally brutally murder Ted Kord for uncovering his plans just before the events of INFINITE CRISIS. Johnny Sorrow is as terrifying as he is theatrical. He’s got a direct line into a frightening alternate dimension called the “Subtle Realms” where a monstrous entity named The King of Tears gave him the mask he wears on his otherwise totally invisible body. Removing the mask renders Sorrow’s body and face visible again, but at the cost of instantly killing anyone who meets his gaze. Johnny’s traditionally been a long-standing enemy of the JSA, but maybe not in the way you might expect. His story dates back to the ’40s but his actual publication didn’t begin until the mid-’90s when he was created and retroactively inserted into the continuity of the Golden Age. He was set into a blood feud with classic JSA members (specifically Sandman and his sidekick, Sandy the Golden Boy), on whom he blamed the accident that had rendered the monster we know him as today—an appropriately unsettling origin both on and off the page for a reality warping, Lovecraftian madman. The “Empress” in Emerald Empress’s name isn’t just for dramatic flair. With the power granted to her via a symbiotic relationship with the Emerald Eye of Ekron, Sarya brutally took over her home planet of Venegar and instated herself as the undisputed leader—the Empress of the entire planet’s population. Of course, a complete planetary coup also secured her spot as one of the most feared villains of the 31st Century, occasional leader of the Fatal Five and mortal enemy of the Legion of Super-Heroes. Not much is known about the Eye itself, other than the power it grants those who bond with it. However, signs seem to indicate that it’s some sort of parasite; that it may actually be the puppeteer rather than the puppet. Sarya’s first defeat was actually a surrender. She had to beg Sensor Girl of the Legion to separate her from the Eye, which would not allow her to die. And speaking of the Legion: their presence has been peppered throughout the DC Universe post-Rebirth, with Saturn Girl’s appearance in both DC UNIVERSE: REBIRTH #1 and BATMAN #9, but no one knows why (or how) she’s arrived in the present. Is it possible that Sarya’s arrival to our time has something to do with her? It’s the warring balance of these personas that actually prompted Doctor Polaris’s long-term rivalry with Hal Jordan. Hoping to find a way to reverse his new powers, Emerson tracked down the Green Lantern of Earth, believing his ring to be strong enough to contain his abilities. But, rather than come to Jordan in peace, the “dark” side of Emerson’s bifurcated personality took over and that was that. Doctor Polaris, super-villain, was truly born. The wild card in an already unbalanced deck, Lobo’s presence among this team may be the most mysterious. A mass murdering, nearly indestructible alien (seriously, his race had the ability to create copies of themselves from drops of spilled blood) with the style of a leather-clad biker, Lobo’s moral compass has always been a little...well, “off kilter” would be putting it lightly. After massacring his entire race, Lobo took up the fine art of intergalactic bounty hunting, hopping from planet to planet as he picked off his targets with very little care as to who or what sort of collateral damage he’d leave in his wake. However, despite his obvious love of violence and chaos, Lobo’s never been one to really ally himself with anyone or anything that wasn’t paying him. Which, of course, begs the question: What about this particular group of villains has made joining up with them worth the Main Man’s time? Nearly everything about Raza Kattuah, aka Rustam, is shrouded in mystery, with the exception of one important detail: His hatred for the Suicide Squad, and for Rick Flag in particular, burns almost as bright as his psionic scimitar. This is likely due to the Squad’s historical intervention in just about everything Rustam has tried to plan with any of the super-villainous terrorist cells he’s attempted to form. Which is saying something because taking on someone with Rustam’s level of military expertise and strategic training is no walk in the park. Now the danger becomes even more real, with Rustam’s impeccable tactical mind working in tandem with this new group of heavy hitters to go up against not only his own bitter rival in the Suicide Squad, but the Justice League as well. It has all the makings of an opportunity to take out two super heroic birds with one cataclysmic stone. JUSTICE LEAGUE VS. SUICIDE SQUAD #1 by Joshua Williamson, Jason Fabok and Alex Sinclair will be available tomorrow, December 21, in print and as a digital download. DC Collectibles: ‘Batman: The Killing Joke,’ ‘Superman: The Animated Series’ and More Headed to Stores in July!